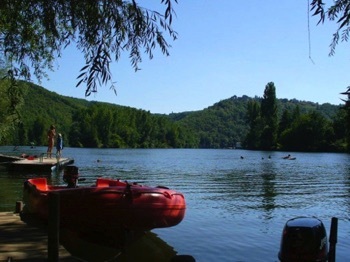 Intro by Campsite... 'Our small campsite in the Lot department is situated in the village Anglars-Juillac, some 25 km west of the capital and famous wine city of Cahors. ou will find our site on the south bank of one of the most beautiful rivers of France, surrounded by vineyards in a hilly landscape dotted with small villages, castles and caves. Our site offers you 25 shaded pitches, with or without electricity, right by the riverside, sanitary facilities, a buffet, a small shop and a quiet and cosy terrace along the riverbank. We also have bicycles and canoes for hire.